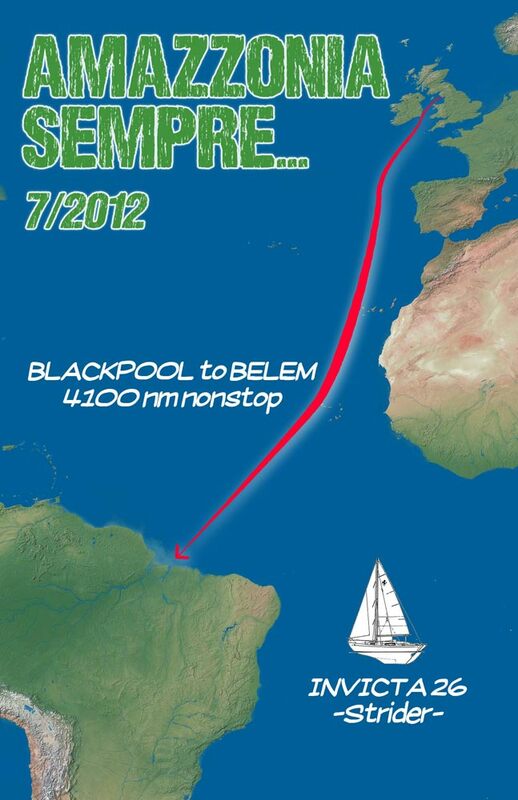 Amazzonia Sempre… is a Atlantic ocean crossing, singlehanded and nonstop from Blackpool(UK) to the Amazon (4100nm). On a 26 feets sailing boat built in 1968. I’m not looking on strange primates or challenges beyond the limits, but only the realization of this sea dream. I have twenty years of preparation on my back, now is the time to do it! The departure with the Bay of Biscay crossing will be the most difficult part. The start will be from Blackpool because it’s where I found the boat. While the destination is the Amazon for more than one reason: I love to think of nature as a great mother and not as something that goes defeated and conquered. I dream to cross an ocean in order to have time alone to find the balance within and out of me, and all this brings me to choose Belem, the gateway of the Amazon, as an ideal arrival. I decided to call my adventure “Amazzonia Sempre…” inspired by the green heart and fighting spirit of the poet Marcia Theophilo. The departure is scheduled for early July 2012, the exact day depend on the weather of the moment and on the state of preparation of Strider. July because according to the “pilot chart” it shows favorable winds. The hardest part will be just the start and the first week, a little bit because I need time to found my rhythm with the ocean but mostly because I have to go through (well off) the Bay of Biscay of undoubted fame. Reached and doubled, always well-off, Cape Finisterre (the extreme northwest of the Iberian Peninsula) i should meet the Portuguese trade winds carrying me toward the south. From there, the most difficult part will be spent and in front of me is the Canary Islands, Cape Verde Islands and then will point to the west-south-west with the idea of cross the equator around 27°W to pass doldrums in the most convenient point. 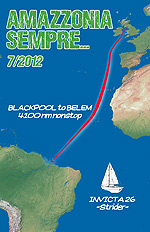 The last part will be in the south-east trade winds that will push me to the goal; Belem port of the Amazon.